You may currently have many of your enterprise-wide reports generated on your mainframe. The business logic has already been coded to create a report to your specifications. However, the procedures in place to generate and distribute these reports are outdated and inefficient. Growing demands for this information cannot be met. CS Link is the solution you have been wishing for. It bridges the gap between the mainframe applications and the client in need of the reports. By leveraging the connectivity of the Internet, CS Link allows easy access to the back-end reports via a standard browser. CS Link provides a fully integrated solution for the management of various back-end applications in an Open Enterprise environment. It uses a true 3-tier Internet/Intranet architecture. This provides the user many advantages. The top tier is composed of your company’s various application servers (back-end). This collection may be a heterogeneous mix of environments such as UNIX, NT, VMS, MVS, or AS/400. These systems are unmodified and kept intact. The next tier is the CS Link (Report Distribution System) Server, which utilizes standard TCP/IP protocol to communicate with the back-end servers. At the same time, it serves as a web portal to allow easy access to the back-end applications by way of the Internet. The last tier contains the clients connected via the Internet/Intranet. Using a web browser, your employees can run or schedule programs that currently exist on your company’s application servers. The CS Link server processes the requests and communicates with the application servers. CS Link promotes reusability and provides extensibility. The three-tier approach isolates your existing servers and shields the end-user from platform-dependent concerns. At the same time, a high level of security is maintained. Access to the back-end servers and the data is tightly controlled. One of the biggest advantages that CS Link provides is the ability to leverage legacy report applications. Since there is no need to modify them, you will still have access to the wealth of data on your servers and have a new Internet-enabled reporting solution up and running in a matter of days. For most companies, an Internet/Intranet solution fits well with their corporate direction. CS Link was designed with this very strategy in mind. Through the Internet, programs would be accessible worldwide. Similarly, distribution of reports electronically is just a simple click away. CS Link provides a user-friendly interface to promote ease of use. By connecting with a standard web browser and logging in, users can easily generate a multitude of reports. CS Link manages the lists of programs on the back-end servers, and provides you with a clear and concise menu. The entire Report Distribution System is highly configurable. It can be customized to fit your specific needs. For initial set-up of available reports and user accessibility, CS Link provides an easy-to-use Administration Module. From providing a customized menu for each user logging into the system to limiting the availability of program parameters; CS Link can easily be configured to meet your needs. Batch reports are normally very time-consuming and usually processed during off-hours (i.e. overnight). CS Link can accommodate these processes by allowing the user to schedule the batch reports and view the generated results at a later time. Many reports are often generated on a recurring basis. Whether the time interval is once a day or once a month, it is imperative that the report is delivered on time. The scheduling capabilities of the system are very powerful features that address this requirement. Reports can be scheduled for immediate execution or for a later time. The selected reports can be directed to run on a specific date and/or time. This is usually done when the requirement is an immediate, one-time execution of the report. Alternatively, the report can be submitted as a routine batch job. That is, a recurrence over a certain time interval an be specified. Examples would be every day, every Monday, the last day of every month, etc. To keep the system running smoothly and efficiently, CS Link has added safeguarding and monitoring capabilities. As part of the system configuration, the administrator has the ability to specify a time period a program is allowed to be run. One scenario where this would be beneficial is for the restriction of CPU-intensive programs running during business hours. CS Link provides the ability to immediately view the output files and/or reports generated by the host programs. 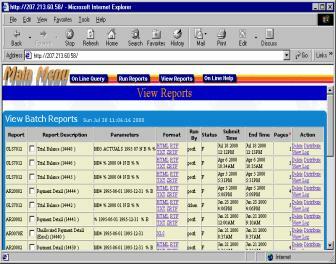 A complete listing of the reports generated can be accessed from the View Reports page. The new reports are clearly marked, and you are notified of any unread reports. The list provides concise, yet detailed information for each item. A report description, the parameters used, who created it, when it was run, and the available output formats are all clearly documented. For immediate data retrieval, CS Link provides the capability to query specified databases residing on the host. The on-line query functionality will return results in real-time. 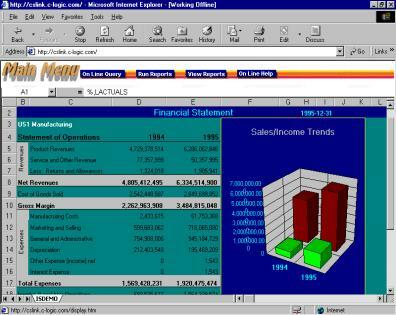 Depending upon the output generated by the back-end application, the results are presented in an acceptable format such as HTML, RTF, or Excel. Additionally, hyperlinks can be embedded in the output results to provide drill-down functionality. To view additional information on an item, all you will need to do is click on it. In turn, this will generate a listing of related data. The hyperlinks are an efficient means of accessing detailed information. Another advantage is that the data provided via the hyperlinks do not necessarily need to reside on the same server from which the original report was generated. This gives the user the power to access data across multiple servers while still viewing a single straightforward user interface. CS Link was designed to maintain a secure environment. Security restrictions are established in advance to specify a given user’s level of accessibility. This prevents unauthorized data accessing while maintaining an open environment. The system offers many levels of security. The first checkpoint of the system is the user login. This not only prevents unauthorized access, but allows the system to automatically customize itself for the specific user. Protection of the company’s servers and data are of utmost importance. A firewall shields the back-end servers and limits their access only through the communications with the CS Link server. Additionally, the applications residing on these servers are made available only to a select group of users. By defining this access list for each application, application executions can be tightly monitored and controlled. Another security feature that CS Link provides is the specification of output masks. This limits the visibility of data for each user within your company. Also known as Page-level Security, this prevents sensitive data from reaching the hands of users who are not given the required level of access. This is conveniently provided when viewing reports on-line, as well as within the report image that is generated for distribution. Based upon their defined output masks, two recipients of the same report will only be allowed to see the data that is pertinent to them. Input masks are another feature that provides additional data restrictions. By limiting the user’s available program parameter options, the reports generated will only reflect what the user is allowed to view. CS Link is a standard 3-tier system, composed of a front-end user interface, a CS Link Server, and the existing hosts in the network. The current system configuration is composed of a Microsoft NT Server, Microsoft SQL Server, and a Microsoft Internet Information Server. However, many of these components may easily be substituted. 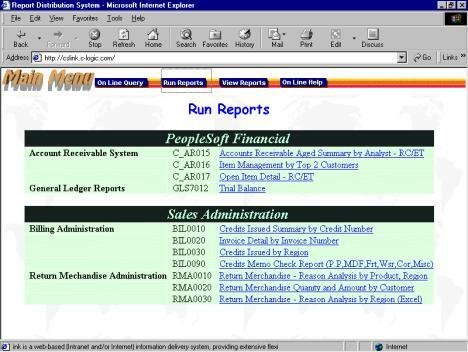 For instance, the NT Server may be replaced with HP-UX; the Internet Information Server by a Netscape Web Server; and the SQL Server with an Oracle DBMS.